How much BrightSource Energy should raise and by what means have generated no small amount of discussions this year. So when we saw headlines that say the venture-backed solar thermal project developer recently raised yet more money and is reportedly going for an IPO, we thought we’d check in with the company to see whether the company is opening a new round of fundraising effort. It turns out, no, the company isn’t going for an E round. It has, however, raised around $26 million on top of the $150 million it announced in May this year, said Keely Wachs, a spokesman for BrightSource Energy Monday. BrightSource set out to raise $215.5 million in equity and options and has raised about $176 million so far, according to its filing with the U.S. Securities and Exchange Commission. Its new investors include the Russian government. “We are well capitalized, and we are focused on getting our project permitted and financed,” Wachs said. Raising the D round is crucial for the company to build its first commercial operation, the 392-megawatt Ivanpah Solar Electric Generating System that received the approval of the California Energy Commission last week. The project is set to rise from leased federal land in the Mojave desert. The federal Bureau of Land Management plans to give its final go-ahead next month. 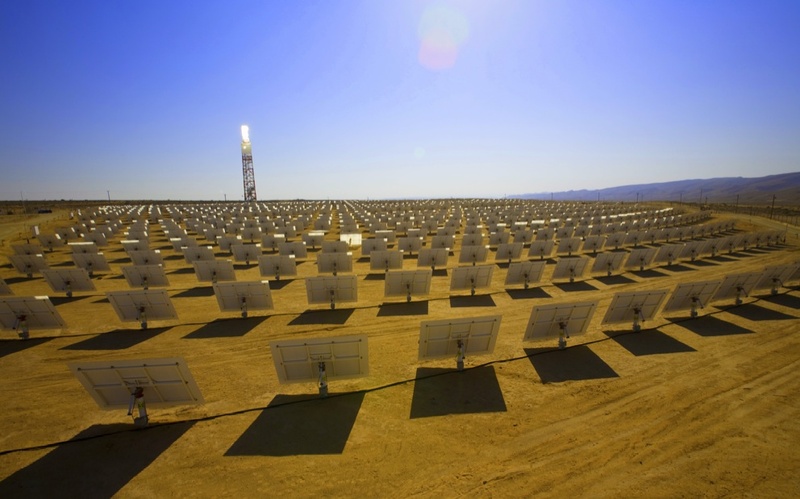 BrightSource plans to start construction of Ivanpah by the end of this year, and it expects to complete it in 2013. The fact that BrightSource can attract more private equity isn’t surprising given that the Ivanpah project was on a list of solar projects to get a fast-track review by federal and state regulators. The company started raising the D round in February this year, around the same time when the Department of Energy announced a $1.37 billion loan guarantee for BrightSource to do the Ivanpah project. The loan guarantee will translate into a loan from the U.S. Treasury’s Federal Financing Bank. The loan guarantee program can provide up to 80 percent of a project’s cost, but BrightSource hasn’t revealed whether the $1.37 billion loan will make up that much of the price tag. It’s certain, however, that the company needs to raise private capital to complete the Ivanpah project. It also will need a whole lot more money to fulfill the rest of its commitment to deliver 2.6 gigawatts total to the Pacific Gas and Electric and Southern California Edison (Ivanpah is part of this commitment). That brings us to the question of whether BrightSource will raise more money by going to the public market. There’s been a lot of talks about an IPO for BrightSource, which hasn’t confirmed publicly such a plan. But two people close to the company did tell Dow Jones VentureWire that BrightSource has hired Morgan Stanley and Goldman Sachs to prepare for an IPO that is likely to take place next year. BrightSource has some time to mold its IPO plan. It has raised enough money to at least get started on Ivanpah. It could even wait until 2012, when it’s expected to start generating revenue from the completed, first phase of the Ivanpah project, according to Next Up Research. A company that can produce revenue and then profit will make a more attractive IPO, though doing so hasn’t been a requisite for cleantech companies. Some of the recent successful IPOs came from companies that have posted heavy losses and needed federal financial aid, including Tesla Motors and A123Systems.